As part of our kitchen re-fresh, I have made up some new tea towels. 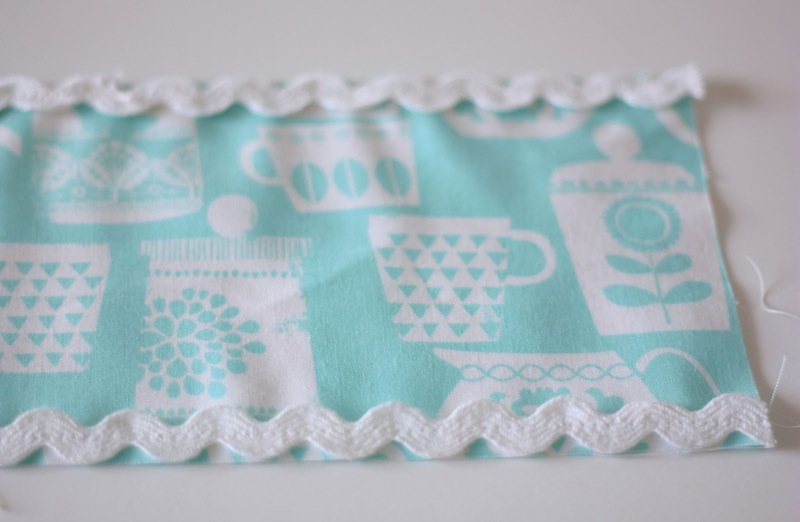 I found the perfect aqua fabric, and teamed it with some white waffle cotton (very absorbent) and ric rac. 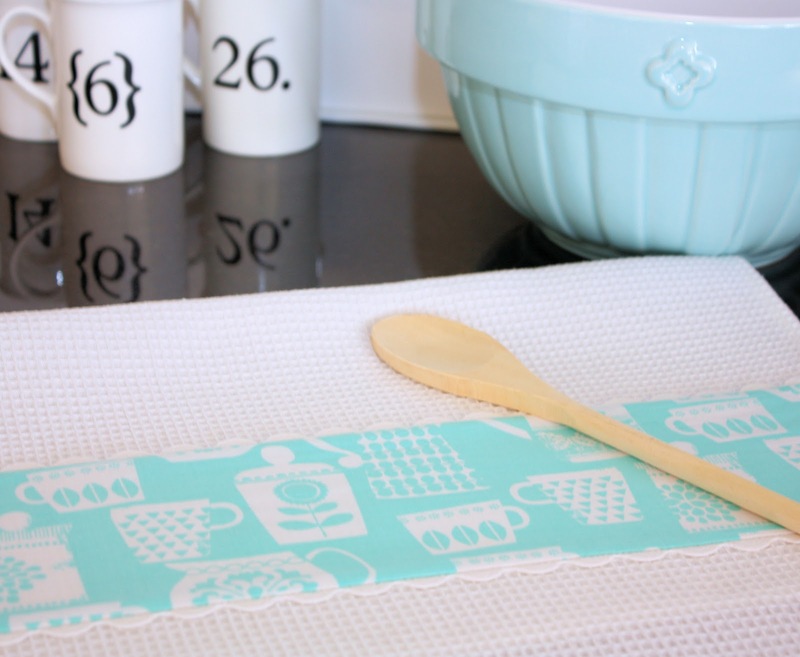 Making your own tea towels is such a quick project. I love having pops of aqua in my kitchen. The aqua is a nice contrast to the white cabinets, stainless steel appliances, and black granite. 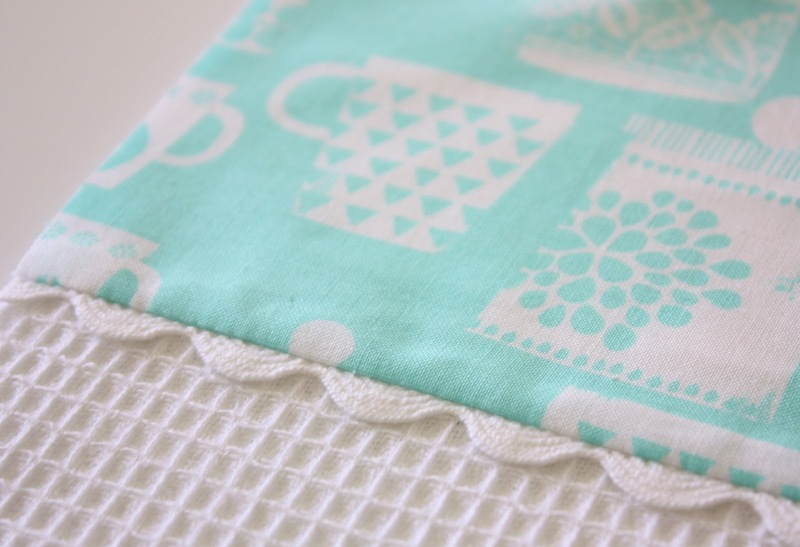 Tea towels are a great project for a beginner sewer or for a child learning to sew, as it is basically just hemming a rectangle of fabric. Or you can buy ready made plain towels and dress them up by sewing on a band of fabric. On the right side of the fabric panel, stitch the ricrac to the top and bottom edges. Fold the ricrac edge under so that the ricrac forms a border on the fabric strip. 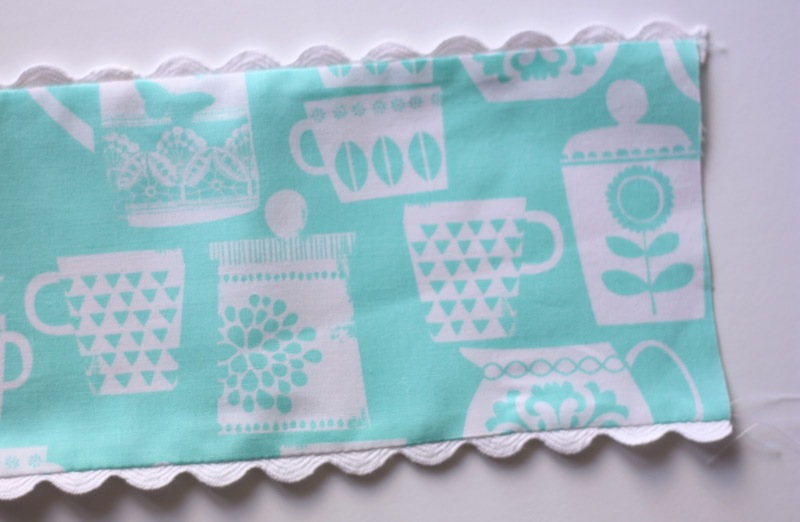 Pin the fabric strip to the tea towel, approximately 6 inches from the bottom edge, and stitch in place. Turn under 1/2 inch on both long sides. Press. Turn under another 1/2 inch and stitch in place. Turn under 1/2 inch on the top and bottom edges. Press. Turn under another 1/2 inch and stitch in place. Next on the sewing list is some new pot holders. 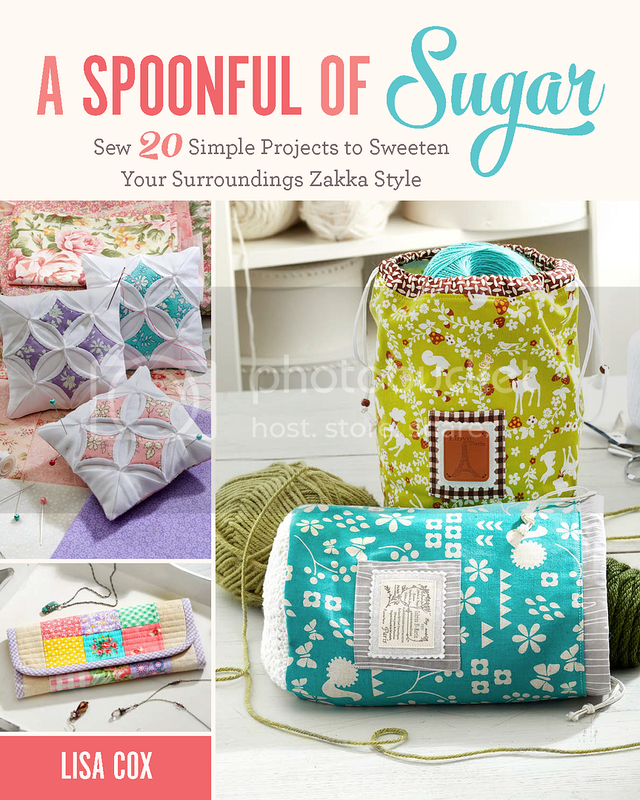 If you follow us on instagram (aspoonfulsugar) you would have already seen a sneak peak! Oh I absolutely LOVE this and these colors!! Will have to do this! Thanks for sharing this easy DiY. Such an awesome idea. 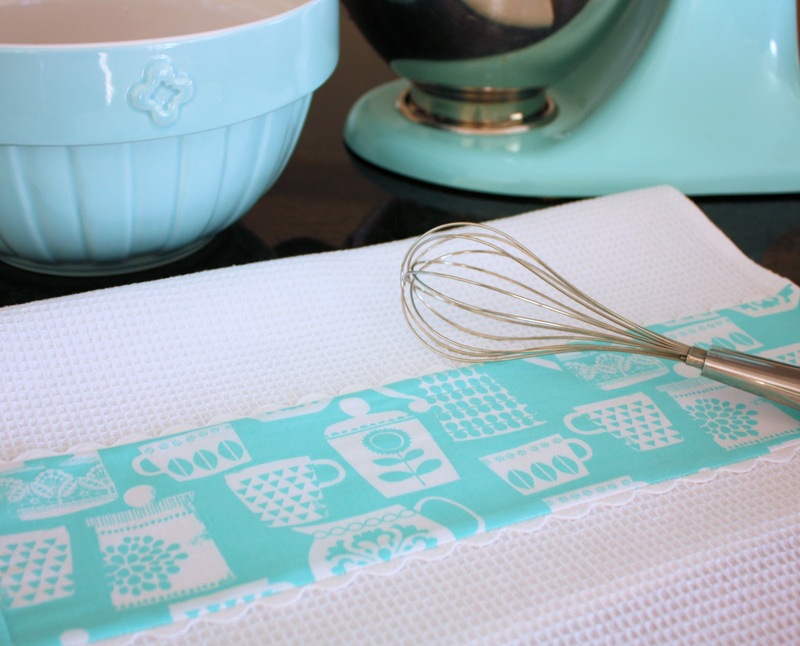 I feel some gifts are in the making, fresh baked goods wrapped in freshly sewn tea towels. Could it get dreamier? That’s great!! What about the edges of the tea towels, is there a special seem you used? adorable and easy to make, thanks for sharing. 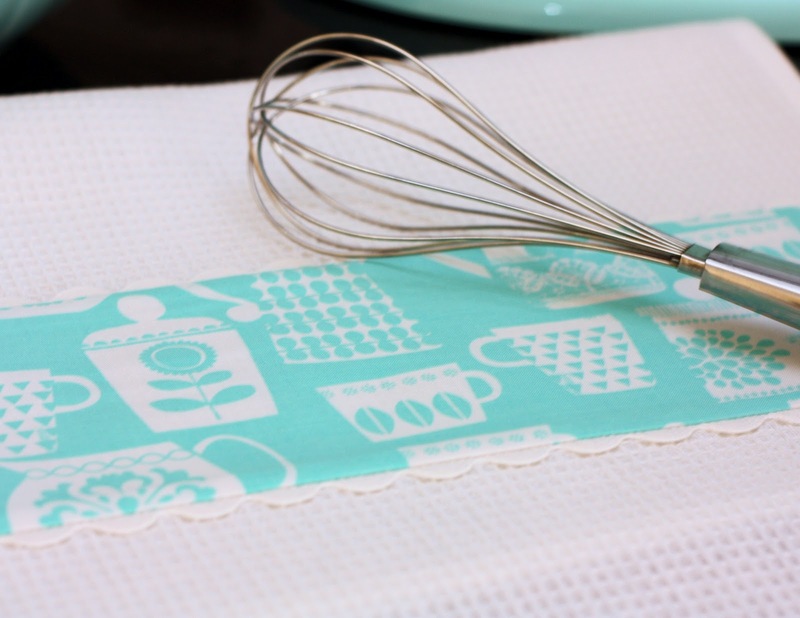 That aqua fabric was made for your kitchen! Perfect match. I have some of that waffle fabric, but haven’t done anything with it yet. Now I have some ideas. Great project! These tea towels look great Lisa, is waffle cotton easy to come by? They look gorgeous! My sister has the very same mixer on order for her brand new kitchen! She is still waiting for the delivery, so there is still time to get them done! Gorgeous! My fave colours and indeed the colours of my kitchen! Clean, fresh looking tea towels who could argue with that. Looking good. 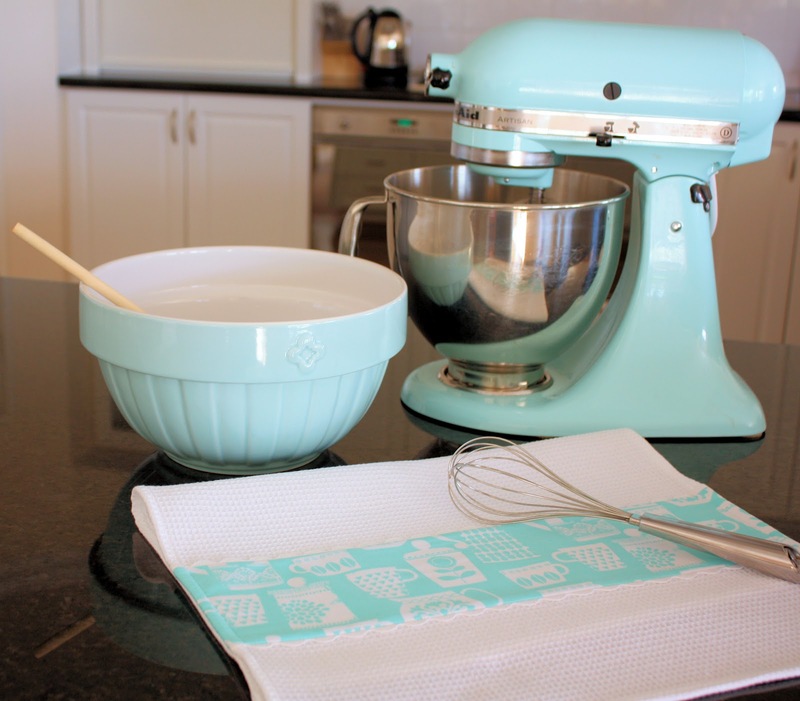 I am coveting your turquoise mixer! Mine is red, but can I justify having more than one? Probably not. Thanks for the great tutorial, I love things with rick-rack, and have some extra dish towels, so I’m going to give it a try! that beautiful and easy to make! thank! Could you please tell me the name or the designer of that aqua fabric with cups?